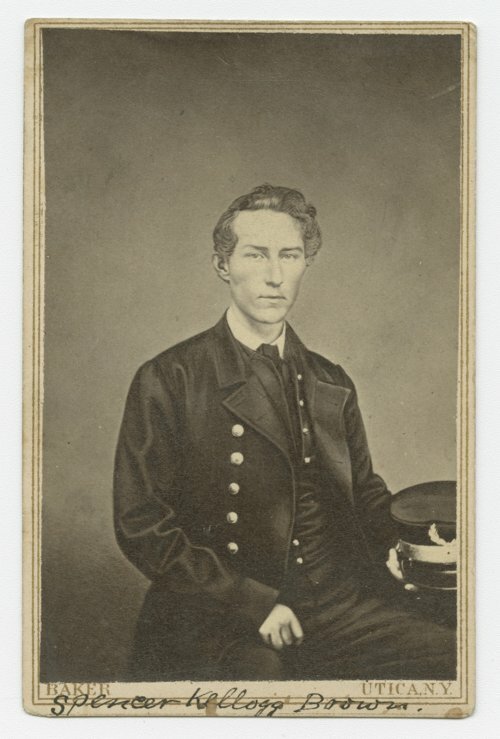 This is a carte-de-visite showing Spencer Kellogg Brown, who was born August 17, 1842, in Kansas. In retaliation for the Pottawatomie Massacre, pro-slavery forces sacked Osawatomie on August 30, 1856. Spencer's family house was burned to the ground during the raid, and Spencer was captured and taken to Lafayette County, Missouri, for several weeks. During the Civil War, Brown was a soldier in the Union Army and served as a spy. He was executed by the Confederate States of America on September 25, 1863.